Question: Please tell me what's wrong with my tophat script? I am trying to find the unmapped reads by fusion-search in tophat, but When submit the command it shows some sort of warning, code is given below. [2018-11-06 20:00:16] Checking for Bowtie index files (genome)..
Also check the command if there is something wrong in it or not? I just drop this post from the senior developer here, so you may consider to change to a more recent tool like STAR or HISAT2. I think there is no star-fusion , I am using tophat for circexplorer2 software, I search that websiter, the pipeline has not star-fusion. I am looking for fusion search to collect the unmapped reads. Its very slow I dont know whats the problem. are these solid reads? 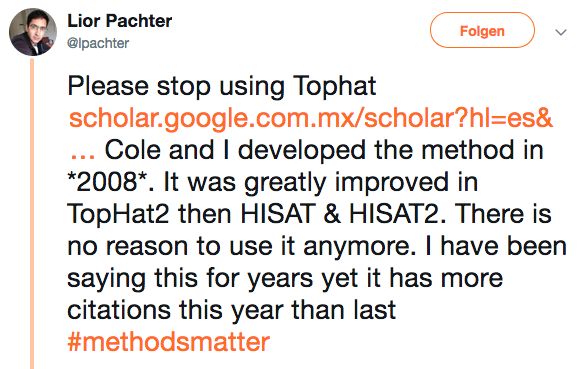 If not, let tophat use bowtie 2 instead of bowtie 1. Tophat expects to find ../Mo17/Ref-index.fa, but the fasta file is not there. Therefore it recreates the fasta file based on the Bowtie index. Everything runs normally. Thanks, but i have reference in fasta format. Then why it shows this warning? and tell me please it will create any problem? because even it shows warning but the program i running normally. So you mean that ../Mo17/Ref-index.fa does exist? But no, this warning causes no problem. It just will run a bit slower because the fasta file has to be recreated from the indices. For the record, I don't consider myself a "bro", but if that's how you want to address people online then go ahead. Sorry for saying bro, It runs very slower, I have start running this job almost 12 hours ago, but till now it is running , I added -p 12 but with 12 cpu it is still very slow. Can you please mention how much time it takes normally?